Kim takes a look at how patient care is changing, focusing on the needs of the patients. Kim Thiboldeaux is an innovative, internationally recognized leader who has dedicated her career to improving the lives of cancer patients, survivors, and caregivers. As the CEO of the Cancer Support Community (CSC), Thiboldeaux oversees a global non-profit network of 175 locations, including 47 CSC and Gilda's Club centers, eight health-care partnerships, and satellite locations that deliver more than $50 million in free support services to patients and families. In addition, CSC administers a toll-free helpline and produces award-winning educational resources that reach more than one million people each year. The Cancer Support Community, formed in 2009 by the merger of The Wellness Community and Gilda’s Club, also conducts cutting-edge research on the emotional, psychological, and financial journey of cancer patients. In addition, CSC advocates in Washington, D.C. and at all levels of government for policies to help individuals whose lives have been disrupted by cancer. As a testament to her drive to serve even more patients and families, Thiboldeaux recently welcomed to the CSC network MyLifeLine, an innovative digital community that includes thousands of patients, caregivers, and their supporters. This exciting advancement will enable CSC to scale its digital services in an innovative, groundbreaking way. Thiboldeaux coauthored two full-length books, Reclaiming Your Life After Diagnosis and The Total Cancer Wellness Guide, and hosts the award-winning Frankly Speaking About Cancer radio show. She also serves on multiple advisory boards, speaks at leading conferences, and frequently appears in national media outlets. In June 2017, Vice President Joe Biden appointed Thiboldeaux to serve on the Biden Cancer Initiative’s Board of Directors. A native of Philadelphia who grew up in a close-knit family of five children, Thiboldeaux graduated from American University with a bachelor’s degree in communications and a minor in Spanish. While at American, Thiboldeaux studied abroad in London and Buenos Aires, experiences that spurred her lifelong zest for travel. She has visited all seven continents, all 50 states, and 50-plus countries around the world, and has no intention of slowing down her exploration of new countries and cultures. Among her many adventures, Thiboldeaux counts a recent road trip as one of her most memorable. She was gifted last-minute tickets to Super Bowl LII. With all airlines booked, she drove her father, a retired Philadelphia city bus driver and lifelong Eagles fan, to Minneapolis where, together, they watched their beloved home team win their first Super Bowl title. 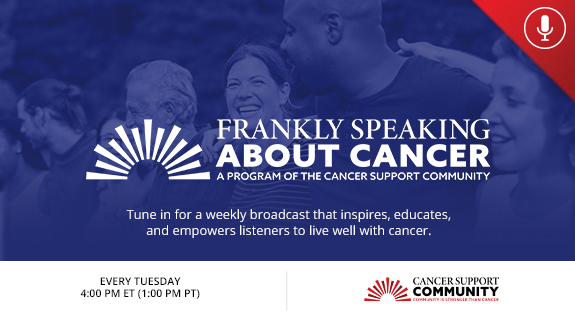 Thiboldeaux hosts the award-winning Frankly Speaking About Cancer®, an online radio show that reaches an international audience via Voice America, the world’s largest provider of internet radio. Previous guests include Ken Burns, celebrated documentarian; Daniel Jacobs, champion boxer; Dr. Steven Curley, Professor of Surgical Oncology, Charles B. Barker Chair in Surgery, and Chief of Gastrointestinal Tumor Surgery at The University of Texas M.D. Anderson Cancer Center; Jonathan Levine, director of Seth Rogen’s critically acclaimed film 50/50; and Darlene Hunt, creator and executive producer of Showtime hit series “The Big C.” You can find more of Thiboldeaux's radio show episodes on Voice America. In this episode (above), Executive Producer Ken Burns and Director Barak Goodman of the PBS documentary Cancer: The Emperor of All Maladies discuss their three-part, six-hour series based on the Pulitzer Prize-winning book by Dr. Siddhartha Mukherjee. Kim has been a frequent contributor to The Huffington Post since 2014. Throughout the years, Kim has written on topics ranging from health-policy issues in the United States to the tremendous financial and emotional burden cancer places on the lives of patients and caregivers. Thiboldeaux addresses the controversial flaws within the American healthcare system in her outspoken articles, "Why Is Our Health Care System Disconnected from What Matters to Patients?" and "The American Health Care Act a No-Go." Along with her views on health-policy, Kim reflects on her years helping those who are overwhelmed cope with the impact of cancer on their daily lives in "17 Years (and Counting) of Standing Up and Speaking Out for People Impacted by Cancer" and encourages patients and caregivers to stand up for their rights in "Patients, Raise Your Voices!" In her most recent article, Kim mentions taking part in the Biden Cancer Intiative with former Vice President Joe Biden and wife Jill Biden (pictured to the right), aimed at ending cancer as we know it. Check out more of Kim's latest articles on our website.